As we all know Games Workshops products aren't cheap, in fact the term "outrageously expensive" could be used to describe some of the price tags for their models. And this causes a dilemma for those of us who want to play Warhammer and Warhammer 40k: Do we bite the bullet, take out a small mortgage and buy Games Workshop's products? Or do we look elsewhere for cheaper models that can be used in Games Workshops systems? For a while now i have been promoting and buying models from other companies for my Warhammer armies. Unfortunately there isn't a big market out there for alternate Wood Elf models, but having decided to do Vampire Counts as my second Warhammer army this gave me the opportunity to do a army whose majority of models would be from other companies, and as you may have guessed from the title of this post the company that i have chosen to buy the bulk of this army from is Mantic Games. Now i have already sung praise for Mantic in a earlier post however the argument was made that Mantic's models weren't as detailed as Games Workshops, and that the detail of Games Workshops models in some way justified their cost. In this post i aim to shine some light on Mantic's models and make the argument that the quality of Games Workshops models in no way goes to justify the ludicrous cost of its products. I will start by comparing Mantic Skeletons to Games Workshop Skeletons. Below is a image of the two products in question. Now the Games Workshop Skeletons are bigger, and are easier to convert, where as the Mantic Skeletons are smaller and, while they can be converted, are not as easy to convert. In terms of model detail and quality i would say that they are both fairly equal. 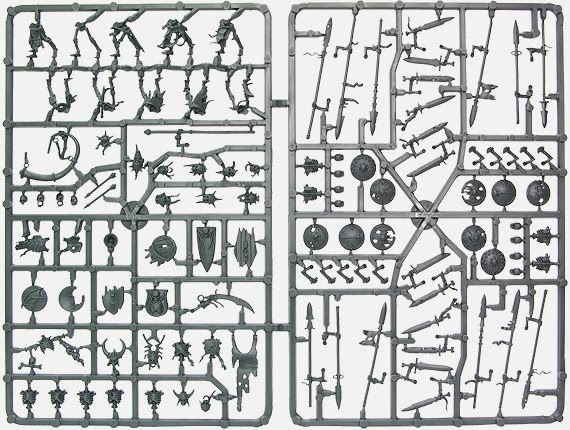 However to do a fair and full comparison we need to see the model components on their sprues. 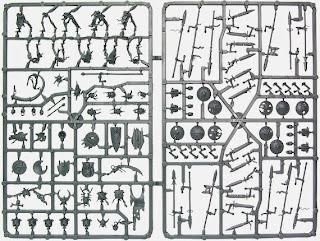 Now just by looking at the sprue you can see that Games Workshop have the upper hand in model flexibility. 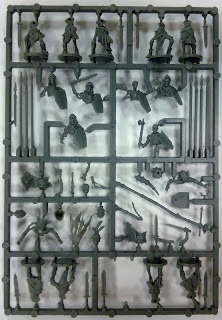 However Mantic's Sprues have more extra bits (undead dog,heads, tomb stones etc) and are easier to assemble. Looking at the two companies versions of the same unit in a vacuum there isn't really a "Better" or "Worse" choice. If you want more flexibility when assembling your models buy Games Workshop. If you want more bits and a more uniform stance for your models buy Mantic. But once you bring price back into the picture Mantic wins hands down 20-0. 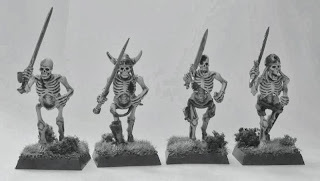 I have already gone on before about the price of Mantic and Games Workshop skeletons but i will simply restate that 48 dollars will buy you 10 Games Workshop skeletons whereas 45 dollars will buy you 40 Mantic skeletons (from Slaves to Painting at any rate). Now some may say "Rex! The detail of Games Workshops models is why they are priced so high, the product is better therefore the price is higher". To that i would say keep in mind how these models (and Spures) are made. A prototype model is sculpted which is then used to create a mold into which boiling plastic is poured thus making the sprues (and mold lines) which Games Workshop then sells. 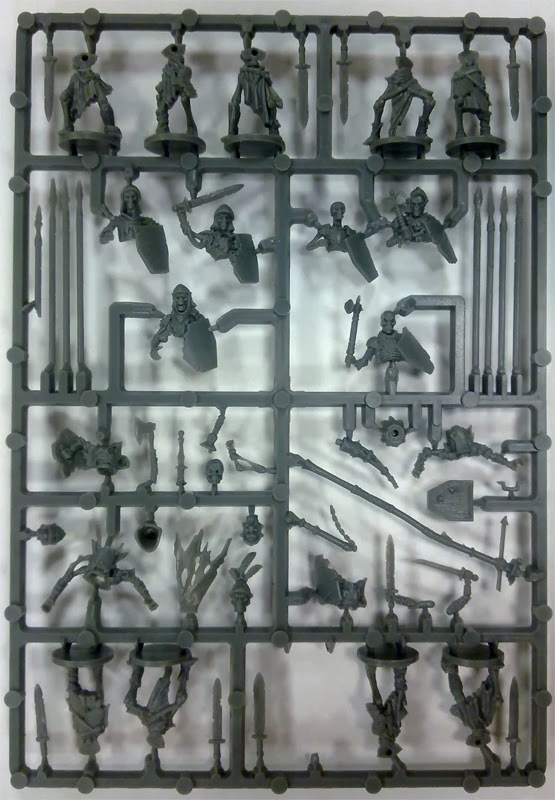 Its not like Games Workshop employes teams of highly skilled sculptors to craft each sprue. If that was the case then i may not be so eager to slam Games Workshops high prices. But this is not the case and so the high quality of Games Workshops models is irrelevant when debating the price of the models. I once read that Games Workshops current CEO stated that his company's goal was to sell quality goods at a profit. That and that alone is why Games Workshops prices are so high. And while it is undeniable that Games Workshops models are of very good quality they simply are not worth their retail price. I hope you found this post informative and helpful. I do plan to look in depth into quite a few companies whose models can be used in both warhammer and warhammer 40k. Untill next time. Price is by far the best part of the mantic range. Saves hundres army wise. "Hundreds", sorry used my phone. Must admit, looking at the sprues, Mantic wins also on ease of assembly. Less bits to put together. That's a big plus for me too. Having bought that exact sprue i can say that assembly is streamlined and fast.